(28 July 2012) Yesterday, C@tO attended an exhibition called ‘Art of the Olympians‘ dedicated to the art works of Olympic athletes. Primarily painting based, the work was produced by many former Olympians and provides a literal connection between art and sport, a fundamental dimension of the Olympic programme. 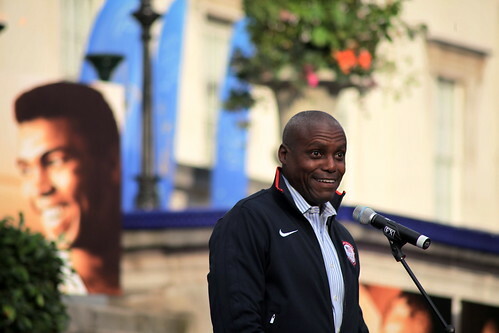 The event took place alongside ‘A Moment’s Peace’, which honored the inspiring Sri Chinmoy and was attended by Carl Lewis, Bob Beaman, and numerous other Olympians. It took place at University College London and included speeches from civil rights leader Bernice King, daughter of Dr Martin Luther King.